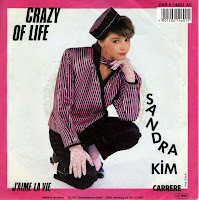 I bought 'Crazy of life' last year, the English version of 'J'aime la vie' by Sandra Kim. 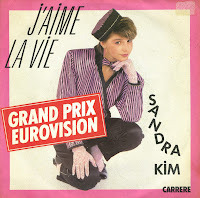 Although that single features the original French version on the B-side, I still decided to buy the original single 'J'aime la vie' because, well, a Eurovision collection is only complete when you have the 'common' edition next to rare abroad versions. The B-side is actually an interesting affair. Despite the limitations of Sandra Kim's high pitched shrieking, there's a great chanson hiding in the recording. 'J'aime la vie' reached number 4 in the Dutch Top 40. Sandra Calderone was born on October 15, 1972 in Montegnée near Liège in Belgium. She took on her stage name Sandra Kim, naming herself after her big idol, Kim Wilde. In 1986, at the tender age of 13, she represented Belgium in the Eurovision Song Contest with the song 'J'aime la vie'. In the lyric of the song she claims to be 15 years old, the minimum age for Eurovision contestants. She won the Contest that year. When her real age was revealed, Switzerland (who'd reached second place with 'Pas pour moi' by Daniela Simons) petitioned to have the song disqualified, but this did not happen.